God is calling us to worship Him today. He wants us to worship with all of our being! Come, let us sing to the Lord! Let us shout joyfully to the Rock of our salvation. Let us come to him with thanksgiving. Let us sing psalms of praise to him. For the Lord is a great God, a great King above all gods. He holds in his hands the depths of the earth and the mightiest mountains. The sea belongs to him, for he made it. His hands formed the dry land, too. Come, let us worship and bow down. Let us kneel before the Lord our maker, for he is our God. We are the people he watches over, the flock under his care. When we worship we can worship alone, but still be in unison with other believers as we all come before Him wherever we are, and in spirit we are in unity. Shout with joy to the Lord, all the earth! Worship the Lord with gladness. Come before him, singing with joy. Acknowledge that the Lord is God! But why do we worship? First of all because He is the creator of all this Earth we live in. If that is not enough then because He gives us food and clothing, He finds us a place to rest our head even when He walked the earth with no place to rest. David planned to build the Temple because he felt God needed a place too. Jesus shared with his followers that He had no place to truly rest his head as His home as well. Yet He made sure His people, believers, had a place to rest even if it was in the wilderness for a while He was with them and gave them rest. If you are homeless today, think of the people who were wanderers for forty years because they were not obedient to God and be sure you are right with Him. God will provide for us if we are obedient to follow His direction. Our homes may not be what we thought they would be but God knows were He needs us to be. 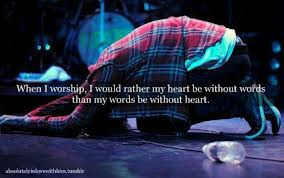 He knows what area we need to be in when we are worshiping Him. He knows what church to send us to as our home church so that we will reach the people He knows will listen to us. It’s a funny thought, but I was working at an Orange Julius in a mall in Washington State when I found that God was waiting to hear my words of repentance and acceptance in my heart and mind. It took a man from Africa coming to a local church then doing what they used to call a “Mall Invasion” where they would go pass out little comic booklets that told us about God. God used those little books to get my attention and teach me of how much I needed Him. Truth be told I thought I could get to heaven on my good works. I was wrong. I was being selfish thinking I was able to be good enough, it took way more than my small sacrifice of doing the right things, and it took Jesus dying on the cross for me to be saved. The little booklets at the mall given in lightness carried a huge directional message for me. If the givers had not been obedient in service to give them out I may not have gotten the message that day. Always work for the good of the Lord and His kingdom my friends, even when you do not know it, you are directing someone to God! Because someone was obedient to the path God put them on, I was able to worship the Lord my God. I am now trying to be obedient to my God in order to follow the path He has set me on that I too may bring someone else light I the darkness! What can you do today How can you show others how to worship Him? By letting them know you do! Did you enjoy the sermon in church this week? Then mention it in passing, the point of a message is for us to take it to the world! Did you have a good read in the Word today? Spread the good news! Tell some one today what Jesus did for you! Had I not been visited by someone sharing the love of Jesus I would not have been the one writing this today! Sure I may have come to know God at some point but the trials and tribulations I may have had to suffer would have been different! I would not reach the same people, if anyone for Christ had the obedient servant from Africa not come to Federal Way Washington in 1981. Thank you whoever you were! I thank God for you doing your part in leading me to Christ by dropping off tracks, or little comic books! I pray that God would bless you for all the lives changed that year! In Jesus name! Heavenly Father, we thank you for those whom You who you send out to share the gospel in so many ways. Help us to share our worship experiences with others that they too may know You! Help us to share how much we love You and how much You love them today, In Jesus name help us to worship You in Spirit and in Truth, in Jesus’ name Amen. Suggested reading: Psalm 95: 1-11, John 4: 1-54 , and Philippians 2:1-30.